Walker Zanger’s new Sketchbook collection combines organic inspiration with unique paint-strokes. Walker Zanger will attend the Hospitality Design Exposition & Conference (HD Expo) from May 4-6 in booth #8095. 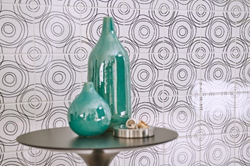 The company will showcase its newest tile offerings for commercial design and hospitality including Kaza, Sketchbook, and a debut of the Architek collection. “Our new collections offer designers and contractors a wide range of options for commercial spaces, whether that be practical wall tile for a new restaurant, or 3-D elements for a bold statement wall in a luxury hotel,” said Walker Zanger Vice President of Design and Marketing Jared Becker. Walker Zanger—the world’s most comprehensive stone and tile company—developed the new Architek collection specifically for larger trade and commercial projects as a utilitarian wall covering, combining practical design aesthetic with durability. Architek is a glazed porcelain tile suitable for both walls and flooring, and comes in a variety of blue hues. It provides architects access to a more affordable wall covering option backed by the Walker Zanger brand. --Kaza: Striking an impeccable balance of artistry and technology, the Kaza collection incorporates tactile 3-D elements for bold accent walls, with a sensitive balance of style and innovation for the modern home. --Sketchbook: Combined with organic inspiration, artisans bring the new Sketchbook collection to life with unique paint-strokes in every tile. Carefully hand-painted, the bold black lines reflect the work of the artisans who create them. No two tiles are exactly alike, giving homeowners a personalized design that cannot be replicated anywhere else. To set up an interview with Jared Becker during the show, please contact Luis D. Sosa at 916-285-9835. To learn more about Walker Zanger and its line of products, please visit walkerzanger.com. For more than 60 years, Walker Zanger, the world’s most comprehensive stone and tile company, combines traditional tile-making techniques with a modern sophistication that transcends any singular design style. A leading choice for design professionals and consumers, Walker Zanger natural stone and tile products can be found in luxury homes, trendy boutiques, lavish spas and resorts, famed museums and fine restaurants around the globe. Walker Zanger is available through 14 beautiful showrooms and more than 150 authorized dealers nationwide. To learn more about Walker Zanger and its line of products visit http://www.walkerzanger.com. HD Expo is the premier trade show and hospitality conference for its industry. Presented by Hospitality Design, it remains at the forefront by offering the newest and most innovative products and services, encouraging and sharing ideas, providing inspiration and connecting hospitality professionals. HD Expo is dedicated to bringing the interior design industry, architects, owners/operators, developers, specifiers and purchasers the best available resources for their projects. This includes the most informative conference sessions led by top specialists pertinent to today’s industry.